Campus romances are often tricky situations. Its difficult to find dates that let your significant other know you really care, but fit into the tight budget of college students and young professionals. After living expenses, school costs and extracurricular activities are factored in, pizza in your doom room is all you can afford. Don’t even think about it – wining and dining at the school cafeteria isn’t going to cut it either. Still, dating never stays in the house on a Friday night and neither should you. Believe it or not, you can date and socialize all while spending wisely. Here are 10 great date ideas for you – the broke college student. In most major cities, poetry slams and open mic night bring in the hippest people, while still keeping prices low. Show that you are art savvy and in the know by suggesting this date idea. If you happen to be in the District of Columbia or surrounding areas, be sure to check out Busboys & Poets.”The relaxed but elegant atmosphere makes it a great place for a date,” recalls Ben Yavitz, a patron of Busboys & Poets who has taken a date to their acclaimed poetry nights. “You can enjoy the poetry, a bite to eat and a nice drink.” New York features the legendary Nuyorican Poets Café in Manhattan. The Writers Room Bar or Fly Poet Spoken Word & Music Showcase are great dates if you are on the West Coast. Can I get two snaps? If you are looking for good food and drinks but want to save money while doing it, consider happy hours – deals offered by restaurants for a few hours of the day. Happy hours are available at the most popular restaurants and showcase smaller portions of their best foods and drinks. Meri James, a happy hour enthusiast and foodie, agrees: “Happy hour is my favorite! It is the same food on the regular menu but a lot less expensive and very social.” Call ahead or check restaurant websites for happy hour hours. Be prepared to sit near or at the bar, many restaurants restrict you to this area for happy hour. Check out www.happy-hour.com for nationwide listings. Looking for culture with a dash of history on top? Look no further than your nearby museums. Not only do they offer the world at your doorstep, but museums are becoming the mecca of chic. Many have bistros, specialty nights and even DJ’s. The Museum of Modern Art, or the MoMA, in New York City offers insane student discounts. With your student ID, you can enter for $12 or buy an annual pass for $50. With the annual passes all guests you bring pay $5. Should you find yourself in Atlanta, be sure to stop by the ultra cool and eclectic High Museum of Art Atlanta. Dates during the day can be the worst. Too often you don’t know how to entertain your date and show them a good time. Relax and let your backyard be your guide. Spring and summer are perfect times for concerts in your local park, in autumn there are fall festivals and pumpkin patches. Orange County California Parks and Recreation as well as Texas Parks & Wildlife are just a two of the park organizations nationwide that put on free concerts. Bring your own snacks, drinks, sit back and enjoy the gratis grooves. One perk of day dates is the wholesomeness of activities you can partake in. If an evening date just isn’t in the cards, fret not and enjoy a few hours at a zoo or aquarium, especially if your date is an animal lover. A local fair or festival will keep you busy with loads of free activities, music, food and art. The National Aquarium in Baltimore features date nights and student discounts, or the Wild Animal Kingdom in Orlando, Fla., will keep your day busy with interactive animal activities. The Iowa State Fair has received international recognition, attracting over 1 million visitors each year. If you happen to live in a city with great, or pretty bad, sports teams, why not spend the day at the stadium, field, court or ice rink? Whether your a Detroit Lions football fan, a Philadelphia Phillies baseball fanatic or Detroit Redwingers hockey nut, take in a little competition and make a new fan of of your date. Most places have student discounts and even same-day ticket prices, which are significantly cheaper. Go team! One perk of living in any big city are the many options for transportation. Have fun, enjoy the weather and leave the food guilt at home with a bikeshare adventure. You get to see the city and burn a few extra calories. You can use your own bike, or rent one from Freewheelin with locations sprinkled across the country. “Bike-shares are easy, fast and perfect for getting around town,” said Andrew Warder, a biker who prefers bikeshares over walking to save on gas and parking hassles. “Plus, most bikeshares have apps for your phone so you can locate a station, pick one up and check out, all from your phone.” Find the best part of town to ease on down the road. 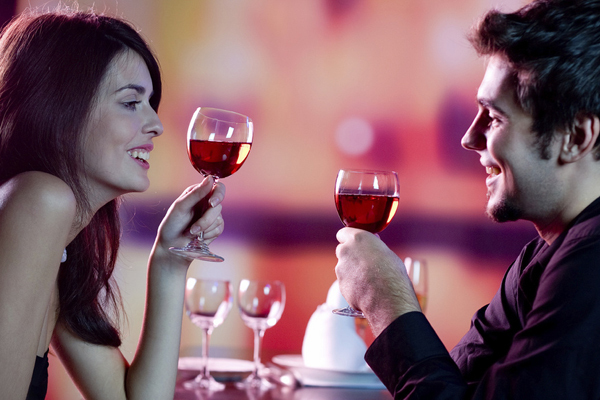 While your date may be sweet, make your date sweeter with dessert and wine. Some frozen yogurt is good for the waistline, while a glass of red wine is good for the heart. If your feeling a tad luxurious, upgrade to a wine bar where they feature both wine and dessert pairings to complement the mood and the experience. If you feel like going out without ending up broke, head to your favorite lounge for music and great drinks in a plush relaxing environment. Women are complimentary, often times until 11:00 pm, while gents should make their way in by 10:00 pm to avoid a cover charge. Enjoy the hottest DJs and an exciting atmosphere while avoiding the cover charge, long lines, crowd and mayhem of actual clubs. Make it a Redbox and Digorno pizza night. Both can be purchased at your local grocery store and will run you about $10 total. Even better is the ease and comfort of hanging out with your date in a no pressure zone, your home. As Chris Hicks puts it, “Who doesn’t love pizza and a movie? They are both favorites and sure to be a hit.” As a recent grad of Long Beach State he prefers movies at home as opposed to the theater and the long lines, ” Theaters are cold and not comfortable and no one wants to hear you talk, even if your on a date.” Bridesmaids and Captain America will be available for rental later this month. Still don’t know what to do?! Relax! There are millions of options – all complements of specialty sites like Groupon and Living Social. Both offer huge savings for very creative and local deals throughout the country. Groupon features a ‘NOW’ section that allows you to see what deals are available in your area instantly. The best part is – you can join them for FREE! So hop online and start saving some major mullah. No matter what your money situation, a little creativity goes a long way in having an awesome time with that special someone.